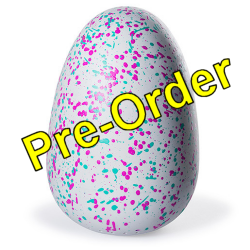 Last week a few UK retailers starting taking pre-orders for the forthcoming Hatchimal egg toy from Spin Master, however few of these opportunities now remain for delivery on launch day (or "hatch day") 7th October 2016. For the latest deals, prices and stock updates see our Hatchimal Stock Checker webpage. Argos has an attractive 3 for 2 toys offer (ends tomorrow 27th Sept) and are currently still taking preorders for the Hatchimals Draggles Green Egg, with the Purple, Teal and Pink colours being sold out in the last few days. Amazon, who are normally quickest off the mark for new releases, have been slow to even list all the Hatchimals properly on their website and are currently only taking pre-orders for the Draggles Purple Egg. Other retailers such as Toys R Us, Tesco, Smyths and Bargain Max have not taken any online pre-orders that we know of. Part of the strange reluctance of these retailers to grab as many sales as possible before launch maybe something to do with the manufacturer’s secretive marketing campaign. Presently, Spin Master have only publicly shown the Hatchimals egg exterior but not the mysterious creature that is about to be born to the world. Set to be unveiled on the 7th October, coined "Hatch Day", we are told advanced technology will allow a new magical and bonding experience for the child. However we understand that a few select retailers may have exclusive colours and designs just for them. The popularity of Hatchimals this Christmas 2016 is an unknown quantity, as is the likelihood of Hatchimal Stock shortages. It may turn out to be a massive craze like Furby and Cabbage Patch Kids or a complete flop, however many commentators within the toy industry are optimistic of a bumper Christmas for the toy.